Over the course of most car lifetimes, vehicles will succumb to dents and scratches. You might be the safest and most responsible driver in Toronto. The only problem is that this doesn’t prevent you from receiving a dent from a less conscientious road user. Thankfully, at Auto Detailing Pro in Toronto, we specialize in not just car dent removal, but fully mobile and even paintless vehicle dent removal. What is PDR aka Paintless Dent Removal? Any impact which results in a dent or minor bumper damage, will often be filled and repainted. Filling and painting, however, can be both costly and altogether ineffective as a repair solution. Because it is often impossible to match new paint to an existing car finish, a perfect dent repair is rarely always possible. The good news, however, is that paintless dent removal by auto body professionals like ourselves can completely eliminate the need for retouching and even filling in the first place. Paintless dent removal works by seeking to repair dents from the inside out. What is more, the system we use works well with almost any aluminum or steel vehicle panel. As a rule, however, painted surfaces should be intact. Meanwhile, successful paintless dent removal will always depend heavily on how flexible vehicle paint is. Thankfully, the majority of modern vehicles are equipped with strong, yet flexible paint. This being the case, mobile paintless dent removal specialists like ourselves, can apply heat, pressure, and specialized panel massaging techniques, to remedy most dents in a relatively short time period. Unlike with other paints, car paint in Toronto is charged for by the millilitre rather than the gallon. This being the case, even minor scuffs and scratches can prove costly to retouch. At the same time, repainting a vehicle panel isn’t as easy as just touching up a scratch by the roadside. If a vehicle will need partially repainting, areas will first need to be sanded, filled, and specially prepared, prior to application of carefully color matched paint itself. Needless to say, such repair preparations can themselves start to incur $100’s in costs. 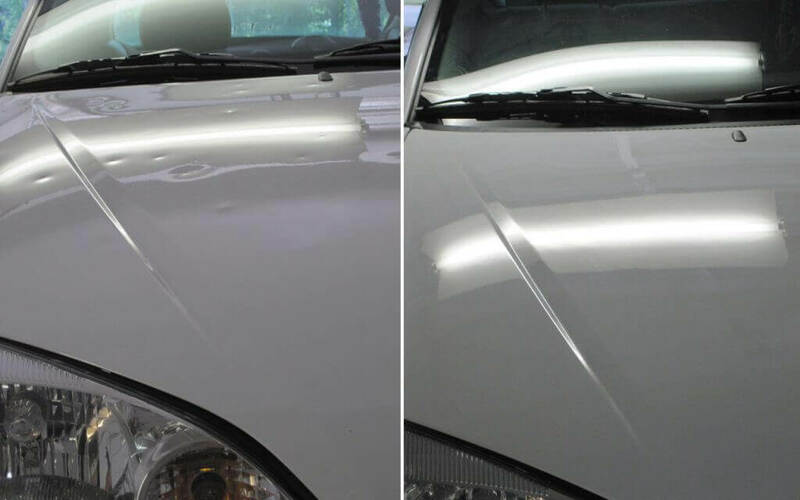 Thankfully, at Auto Detailing Pro, we help Toronto car owners save money by carrying out roadside dent removals which negate the need for full bodyshop repairs and paint restorations. Car bodyshop dent removal will often require vehicle owners to use a hire car or courtesy car while their own car is being repaired. The good news, in this case, is that our fully mobile PDR service can be called upon to carry out on-site repairs around a time which is convenient for you. All you need to do is tell us where and when you need us to be, as well as give us some indication in regard to the severity of the dent which you are looking to have repaired.